It does this by capturing/filtering network traffic of this Computer, Categories traffic as Inbound traffic or OutBound traffic, Use pre-Defined Rules/Filters, and perform action such as, Allow/Block traffic. 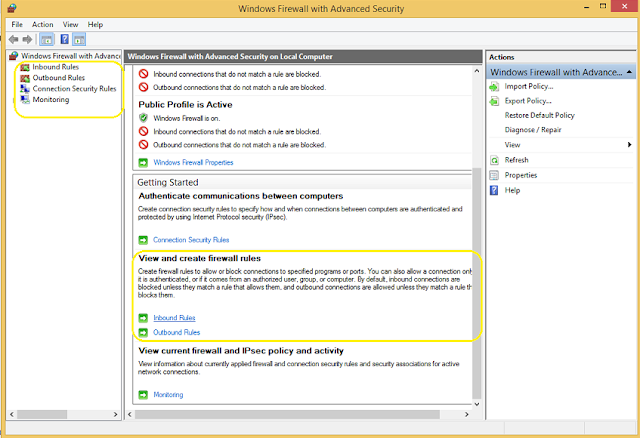 There can be only two types of Traffic, inbound traffic or outbound traffic, Therefore, There are two Rules for Windows Firewall. Inbound traffic is blocked by Default on Windows, So If you wanna use any Application/Software, Which will share something over your Network, Windows Firewall will prompt you to create/allow Inbound Connection. 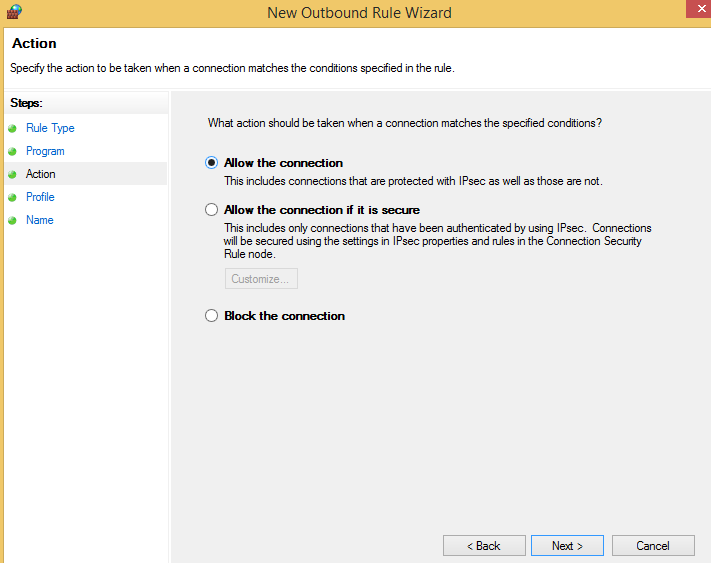 Outbound traffic is allowed by default, But (Generally) You wanna create Outbound Rule, to Block Connection for Any Application/Software. Why Windows Firewall has Domain, Private and Public Profiles? 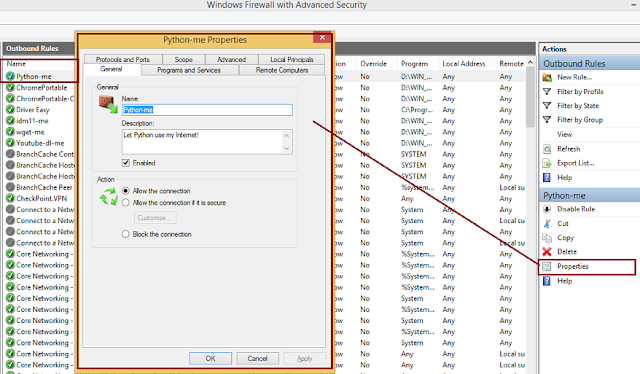 Windows Firewall can automatically detect, which type of network you wanna connect to, So it will prompt you to Choose Proper Network Profile for that Network Connection, For Example, If You want to connect to your Home Router, Dongle etc, Windows will Recommend You to Choose, Private network Profile for this Network Connection. And When You want to connect to Public Network such as Public Wifi, LAN etc, Windows will detect it as Public Network as Recommend you to Choose Public Network Profile, Basically Public Network Profile is Configured as Most Secure than other two network profiles. 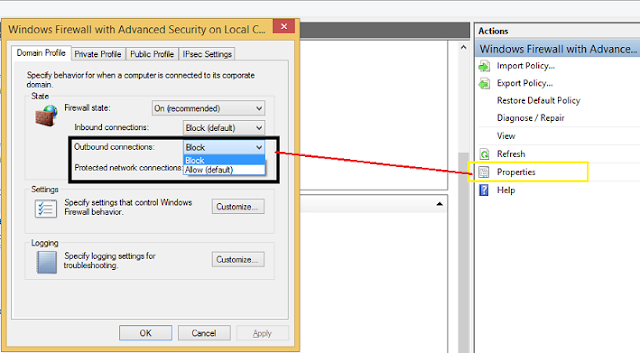 Note: Windows Firewall has advanced settings for these profiles. netsh advfirewall firewall delete rule profile=domain,private,public name="wget-me"
consec         - Changes to the `netsh advfirewall consec' context. 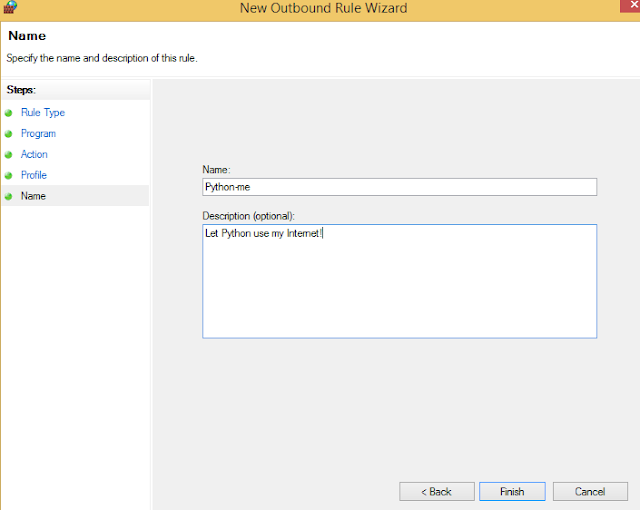 export         - Exports the current policy to a file. 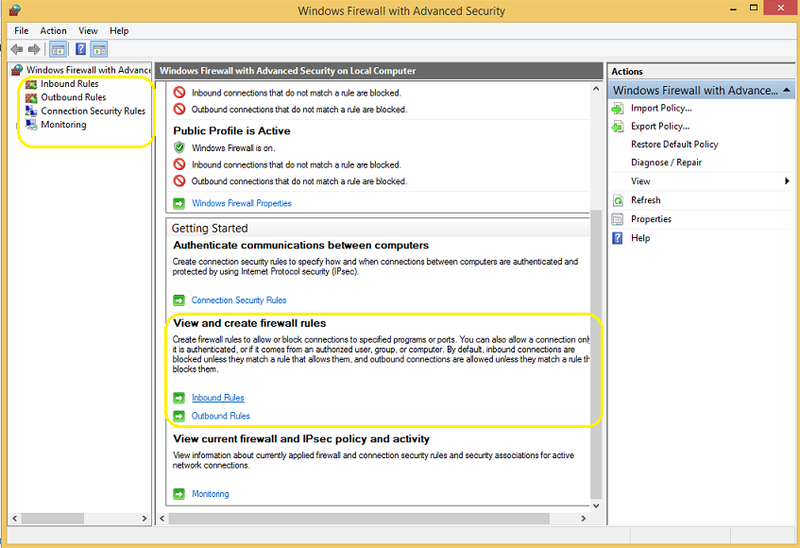 firewall       - Changes to the `netsh advfirewall firewall' context. import         - Imports a policy file into the current policy store. mainmode       - Changes to the `netsh advfirewall mainmode' context. monitor        - Changes to the `netsh advfirewall monitor' context. reset          - Resets the policy to the default out-of-box policy. set            - Sets the per-profile or global settings. show           - Displays profile or global properties. => netsh advfirewall firewall /? 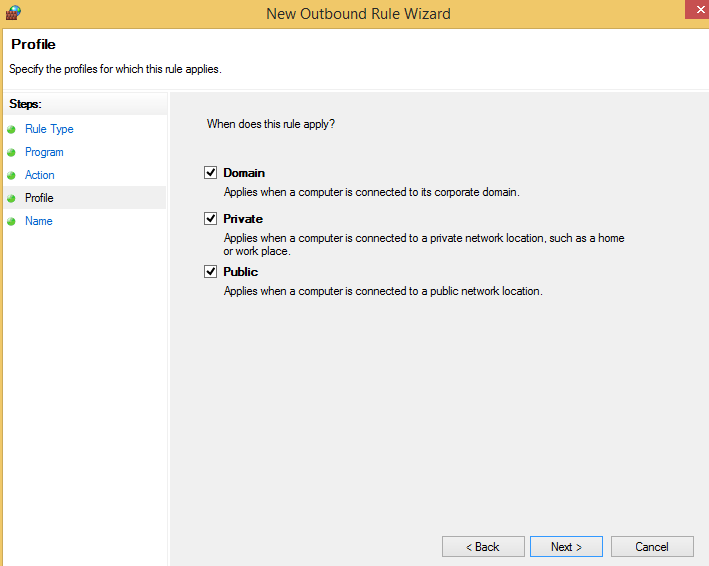 add            - Adds a new inbound or outbound firewall rule. delete         - Deletes all matching firewall rules. set            - Sets new values for properties of a existing rule. 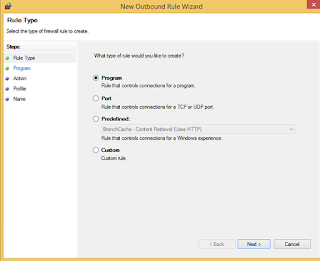 show           - Displays a specified firewall rule. => netsh advfirewall firewall add rule /? 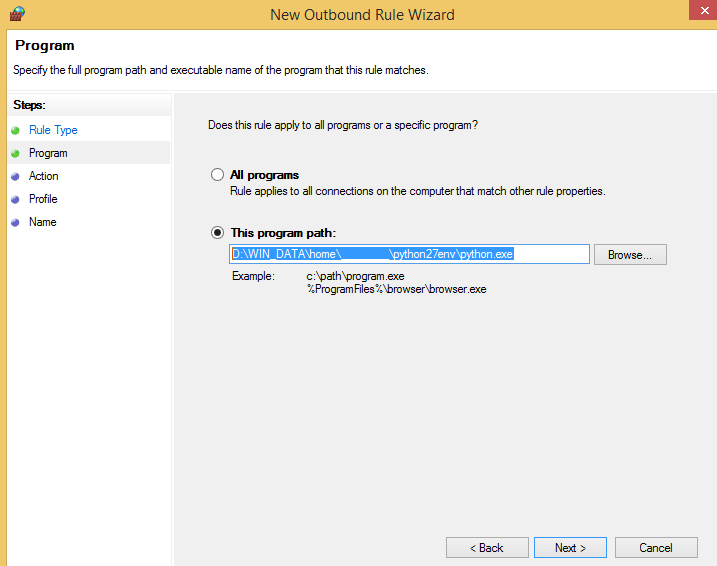 - Add a new inbound or outbound rule to the firewall policy. - Rule name should be unique and cannot be "all". authenticate, authenc, authdynenc, or authnoencap. it is secured, but not encrypted, using IPsec. all subsequent communications are fully encrypted. - If action=bypass, the remote computer group must be specified when dir=in. - If service=any, the rule applies only to services. - ICMP type or code can be "any". 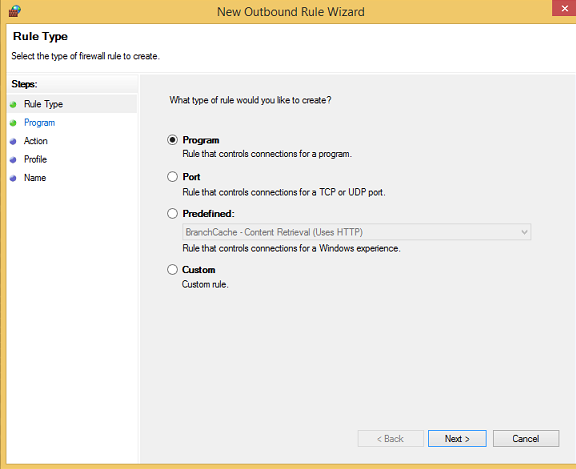 - Edge can only be specified for inbound rules. 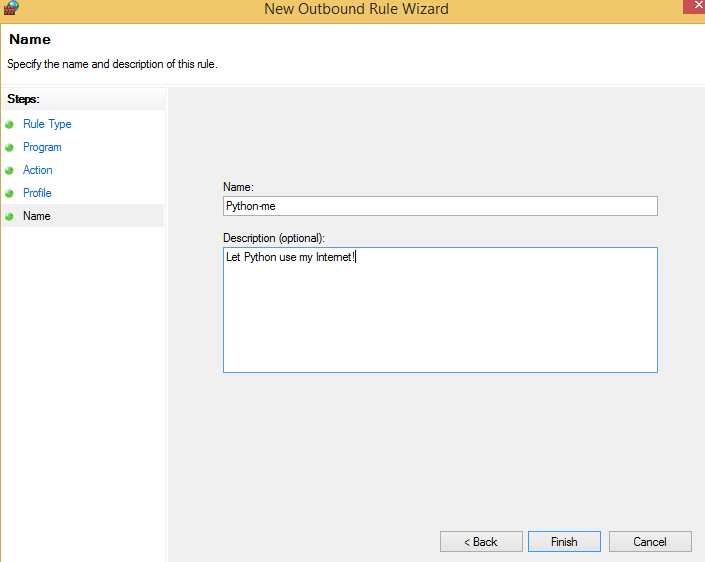 - AuthEnc and authnoencap cannot be used together. - Authdynenc is valid only when dir=in. netsh advfirewall firewall add rule name="allow browser"
netsh advfirewall firewall add rule name="allow80"
name="Require Encryption for Inbound TCP/80"
netsh advfirewall firewall add rule name="allow scanners"
=> netsh advfirewall firewall delete rule /? - If multiple matches are found, all matching rules are deleted. netsh advfirewall firewall delete rule name="allow80"